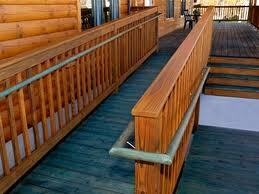 A wheelchair ramp may be the next best thing to sliced bread if you are dependent on a wheelchair. Otherwise, building accessibility goes unnoticed to many. And unnoticed can cost you some important health benefits of getting out. My goal with all my patients is to help them Get up and Get out! When you can explore your world and safely and effectively managing your wheelchair on a ramp, you truly have remote control... control over your life in a remote area! Now you can get outside and enjoy the benefits of fresh air, sunshine and the great outdoors! Troubleshooting is, however, part of life and no two ramps are built the same. This can present problems for many who are just learning or who run into those 'underdog ramps' that weren't built quite up to par or where a knock off piece of medical equipment. My experience in my 15 years of home health care physical therapy from East Coast to West Coast and many places in between has granted me some insight into these life savers and the potential problems they can hazard if prudent judgement and knowledge are net met with sound advice and know how. Be sure to purchase some no slip sheets from your favorite hardware store if it will get wet or icy. Put a one or two inch high border on both sides to keep wheelchair wheels from succumbing to gravity - even if you have a railing. What Are Wheelchair Ramp Hazards I Need To Be Aware Of? Ramps that are too steep invite falls and out of control wheelchairs. Some inexperienced builders and contractors don't consider exactly who will be on those ramps in the first place. Usually weak, incapacitated, balance challenged and those using medical equipment, wheelchairs, walkers and various other medical devices. Have someone assist you in going up and down this ramp. Play it safe. When coasting down, keep a firm hand grip on your break rims and sit back in your wheelchair seat. When wheeling up the ramp, lean forward, keeping leverage to your advantage. If possible 'No Slip' stick on 'plates' should be added about every 6 inches for better wheel traction. Motorized wheelchairs and scooters usually have it made with steep ramps but you must keep the tip factor in mind as well. Speak with the owner and request a rebuild to code. In most states, building a wheelchair ramp to code is law. BEWARE! is all I can say. Most of the time cost and lack of know how in making the ramp safe by installing handrails are the two top reasons some wheelchair ramps lack this item. Some figure that those in wheelchair don't need handrails. You'll be crying all the way to the emergency room! Ramps without handrails are like cereal without milk... edible but why bother. Stay in the center of the ramp. Use your feet if possible to assist you in keeping your wheelchair in the center. A wheelchair ramp can be like a new set of legs - giving you safe and easy access to the outside world...now, go dance! 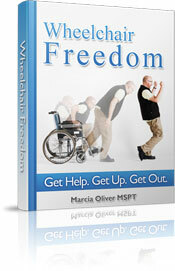 Our new 74 page e-book, Wheelchair Freedom! Get Help. Get Up. Get Out. teaches you how to safely, easily and effectively master those wheelchair exercises needed to gain functional strength for legs, chest and back to help you get back on your feet again. Added bonus's include wheelchair safety, wheelchair accessories and how to master the difficult wheelchair to car transfer.